Today, we bring you the news of the release of the Krayon Everywhere. A relatively new brand, Krayon was started in 2013 by Remi Maillat, who is a design engineer by training, and studied micromechanical engineering at the Le Locle University of Applied Sciences. Since then, he has been using this training to create watches for himself and one-off pieces for special clients. 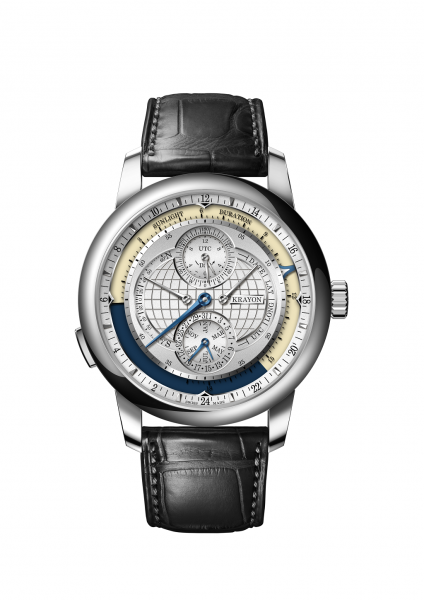 The “Everywhere” is the first watch for general release from this brand. Their philosophy focuses on simplifying the complexity of the technical aspects of the watch, and they are looking to set themselves into a new category of watchmaking through this niche. A host of indicators on the dial. In this case, and early morning diving expedition was the source of inspiration for the “Everywhere”. Unlike it’s source of inspiration, this watch is not meant for diving. It calculates universal sunset and sunrise times at any location, which is a complication that has yet to be seen. All this is functionality is surprisingly controlled by the crown and the pusher, which is significant as many parameters have to be combined to calculate the times for sunrise and sunset. In this implementation, Everywhere uses the latitude, longtitude, UTC time zone, the date and the month for calculation. 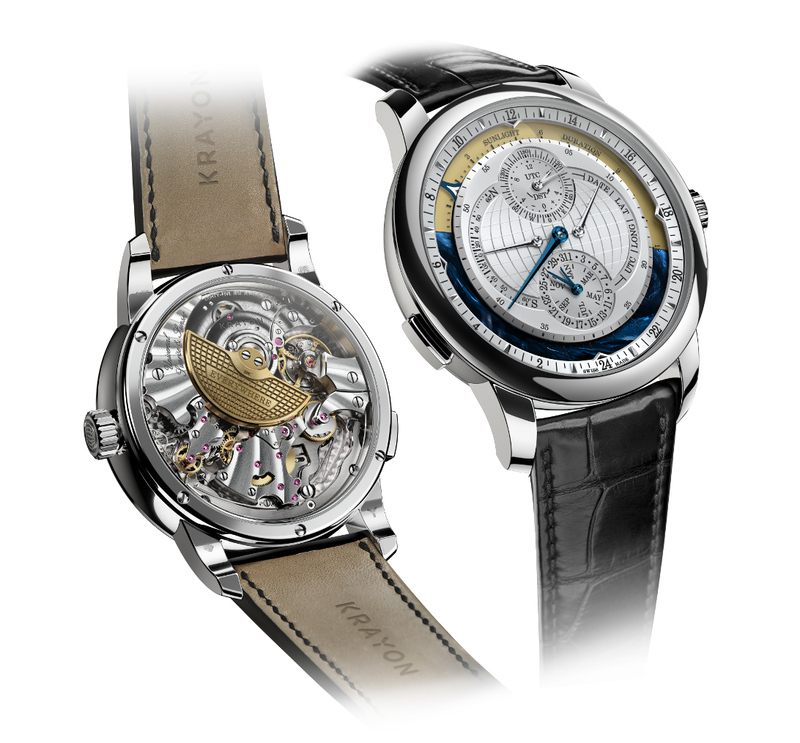 Date, latitude, longitude, UTC – is selected using the pusher on the left side of the case, then set from the crown. The default setting is the date as this corresponds to the most frequently used function. Furthermore, adjustments can be made by turning the crown forwards or backwards, thereby protecting the mechanism against damage caused by mishandling. The dial itself attempts to show as much information as possible from the complication that lies within. The hands and indicators in daily use – date and time – are in blue to visually stand out for maximum legibility. Contrasting with them, the hands corresponding to the settings have a softer colour which can be white gold or pink gold, depending on the version. Hours are read from the contour of the dial thanks to a blue arrow on a 24-hour scale, which also shows how many hours have passed since the last sunrise. Minutes are shown by a large central hand. A subsidiary dial in the upper part of the main dial displays longitude between +180° and -180°, shown by the longest of the two hands. The shorter hand points to the UTC time zone and advances in half increments to take into account every time zone in use around the world. When required, the DST (Daylight Saving Time) indication adjusts for summer time. 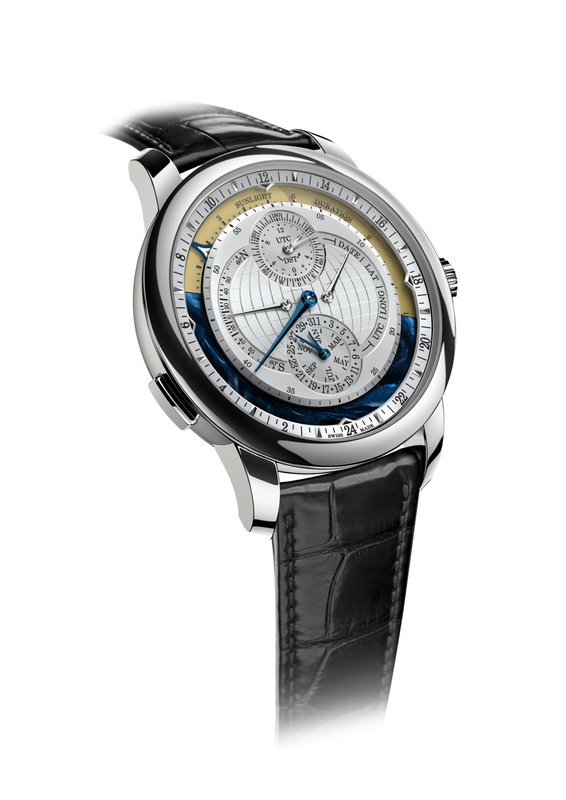 Two hands occupy the centre of the main dial: the one on the left covers latitude between +60° and -60° while the hand on the right shows the chosen parameter: date, latitude, longitude or UTC. A subdial in the lower portion of the dial presents date and month. As for the movement, Remi calls it the USS calibre, which stands for “Universal Sunset and Sunrise”. 595 components were involved in the making of the movement, and it is 6.5mm thick. It also combines parameters that give opposing information to simplify the design further as per Krayon’s philosophy, such as combining the sunset and sunrise times in the same indicator. A function that has not been advertised is the equation of time, and this is not seen on the dial, but necessary for the movement to calculate the different parameters of the sunset and sunrise times. This calibre is fitted with four differentials, 84 gear assemblies and a total of 145 gear parts, and three patents have been filed to protect these inventions. Automatically wound by a white gold micro-rotor, it delivers a 72-hour power reserve and beats at a frequency of 3 Hz. The finishing and decoration of Everywhere are done entirely by hand. In addition, two variants of case size 42mm are available in pink gold or white gold, and as often seen with independent brands, can be fully personalised on request. Variants: White gold or pink gold. Daylight hour indicator comes in either yellow or pink, and watch can be personalised on request.